Cleanse and Brighten Skin without Dryness. This 100% soap-free cleanser is a nourishing blend of pure orris root and neem leaves, to cleanse and brighten skin without dryness. Fresh-gel formula will not disturb the skin’s natural pH balance. 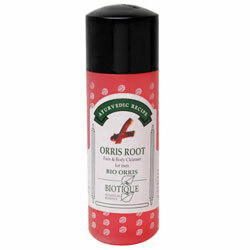 Orris Root comes from the bulb of an iris plant, used for centuries for its soothing and anti-bacterial properties. This aromatic herb acts as a natural anti-pollution agent to refresh body and senses. Massage over wet face and neck, lather and rinse with water, A.M. and P.M.